2013-2017 Ford Explorer 3.5 V6 Turbo Injen PowerFlow Intake4RocMay 6, 2013Purchased the powder coated version and it looks good. I would not purchase this product again. The Injen maintains the lower half of the stock air box and there is no seal to the hood. The Injen draws hot air from the engine compartment and has no heat shield. The Airaid setup uses the the airdam and heat shield. it took a couple of extra weeks to get my order because of the powder coating. They should let customers know this prior to ordering. I did not notice any huge performance gains. WHat I did notice was quicker throttle response and you can hear the turbos spool. This particular Injen Intake uses a revolutionary design that. At the end other of the Injen Intake is the Injen High Flow Air Filter Element. The Injen air filter can be cleaned and reused for as long as you own the vehicle. An incorporated velocity stack smooths out airflow to help maximize power gains. 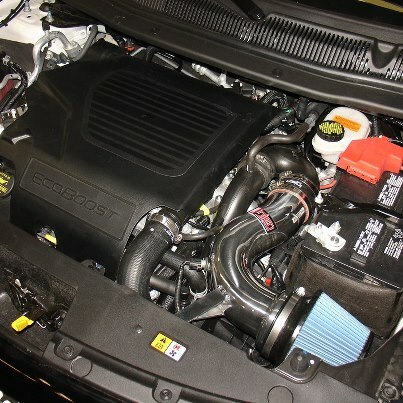 Comprehensive installation instructions including photos make installation of your new Injen Intake easy enough to do yourself with basic hand tools in an hour or less. Everything you need to install this air intake is included and the intake comes with a lifetime warranty. Injen Power Flow Intake Systems exceed OE standards and as a result will not void any existing factory warranties that you may have. Additionally, you'll enjoy increased horsepower and torque, as well as improved throttle response. Fuel economy gains, especially during freeway conditions, are commonly achieved helping the unit to pay for itself over time. Injen dyno testing reports gains of 21hp and 19 lbs of torque. The Part number for this item is: PF9005P or PF9005WB (depending on your color choice) and it fits 2013-2017 Ford Explorer 3.5 V6 EcoBoost models.